Immersed Video Promo: What is Immersed? Imagine what it might be like to live below the waters' surface. What fun, interesting, and colorful creatures might you see swimming among the coral reefs? What strange and dark creatures might you find lurking in the shadowy depths? We have limited space so please no pieces larger than 24” x 36”. If your piece exceeds that, please contact us. All submissions must include underwater and sea life themes, imagined or real – no landscapes or beach scenes please. We are accepting new art for the Immersed exhibit. between the hours of 11am–5pm. $10 non-refundable submission fee (per piece) for the first 3 or $30 for 4 submissions. Artists must submit by dropping off their work at CityArts Factory in Gallery 29 for review during the drop-off dates listed above. All submissions MUST be labeled on the back of each piece with the following information: Artist's Name, and Title. Art work will be juried into the show at the time of drop off. It is recommended you supply a short artist bio or statement with entry form for our records. This is an excellent opportunity to boost awareness for our hobby and your skills, club, or business, by participating in Immersed, Orlando’s premier aquaculture art gallery. Your unique aquascaping talents will be showcased in the heart of Downtown Orlando for an entire month. This is a great opportunity to increase awareness for this great hobby. Businesses, this is your chance to show Orlando what services your locally-owned company can provide. Freshwater, Saltwater, Aquascaped, Planted, Hardscaped, Corals, Live Rock, Invertebrates, Labyrinth Fish, Unique Aquarium Design, and more. Not only is it in your favor to ensure your display remains maintained throughout the duration of the exhibit, but we require it. Please keep this in mind when designing and stocking your aquarium display. Please perform all maintenance and feedings during regular gallery hours, Tuesday – Saturday, 11am – 6pm. If you require access Sunday or Monday, please let us know so that we may accommodate your request. Application and submission fee must be received by Friday, February 13 so that we may confirm our final floor plan. Space is limited so apply early! All aquascaped tank submissions will include an art tag, that will list the name of the entry, artist/aquascaper, and if applicable, the tanks’ sponsor. All participants are allowed to make available related business cards and brochures. Please provide your own small pedestal for this information if necessary. Get creative with an etched stone inside your aquarium from Constant Rock Art. between the hours of 11am – 5pm. $25 non-refundable submission fee (per aquascaper) + $1 per gallon per container (aquarium/sump). 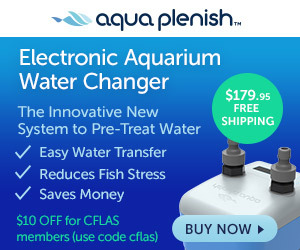 Aquascapers must submit by sending an email to [email protected] with a description of the aquarium design including livestock, overall dimensions of the aquarium and stand to determine floor space required, and volume by Friday, February 13, 2015, along with your submission fees. It is recommended you supply a short aquascaper bio or statement with entry form for our records. Artist and aquascapers are encouraged to attend. Artwork must be framed and ready for hanging or display. Please be sure all pieces are wired. *Additional fee may be incurred to wire pieces for show. It is recommended that artists and aquascapers attend opening night, and media night. All sales will be reconciled within 10 days of the show closing. Artist and aquascapers should include legal name on submission if different from working name. After-show closing, all artwork and aquariums must be picked up on the day(s) indicated for pickup. Neither CityArts Factory, Pink Hair Productions, nor Central Florida Aquarium Society is responsible for damage during storage to any artwork or aquariums not picked up after posted pick up date. Any artwork not picked up within 14 days of the show closure will become the property of Central Florida Aquarium Society. Any aquariums not picked up by the last day for aquarium load-out will become the property of Central Florida Aquarium Society. CityArts Factory, Pink Hair Productions, and Central Florida Aquarium Society will make every effort to carefully handle and protect artwork and aquariums, however, neither CityArts Factory, Pink Hair Productions, nor Central Florida Aquarium Society can be held liable for damage to artwork, aquariums, or any personal injury sustained while participating at CityArts Factory. Neither CityArts Factory, Pink Hair Productions, Central Florida Aquarium Society, nor the Downtown Arts District is liable for theft of any artwork or aquariums displayed within the premises. CityArts Factory and the Downtown Arts District will make every reasonable effort to maintain a secure premise for our artists and aquascapers. Neither CityArts Factory, Pink Hair Productions, Central Florida Aquarium Society, nor the Downtown Arts District insures any art work or aquariums displayed. Artists and aquascapers are welcome to provide their own insurance. The exhibit will feature a variety of themed art by local artists and photographers, but it doesn't stop there! There will also be beautifully aquascaped aquarium displays set up throughout the gallery, designed by local enthusiasts, hobbyists, aquatic gardeners, and business. CFLAS is a group dedicated to aquaculture, ingenuity, and art. Visit cflas.org for more information. PHP is involved in all forms of event production for art and entertainment events. Visit pinkhairproductions.com for more info.